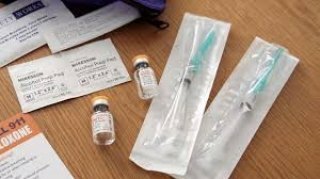 A recall of the opioid overdose antidote Naloxone does not affect the batches distributed in or near Huntington, Fire Chief Jan Rader, who is also a member of the Mayor's Office of Drug Policy, confirmed to HNN this afternoon. Elizabeth Adkins speaking on behalf of the Cabell County Health Department explained, referring to a WV DHHR statement, that "we are using a different brand." The release stated: "DHHR is using a different brand of naloxone, Amphastar, which is not included in the FDA’s recall of the brand Hospira." The manufacturer, Hospira and the US Food and Drug Administration said Monday, there is a possibility for . "loose particulate matter on the syringe plunger" which could result in a range of adverse events. According to the FDA, the patient has a low likelihood of experiencing adverse events ranging from local irritation, allergic reactions, phlebitis, end-organ granuloma, tissue ischemia, pulmonary emboli, pulmonary dysfunction, pulmonary infarction, and toxicity. Asked about the possibility of a connection to the Hepatitis A outbreaks, Adkins, reminded, speaking in a non-medical sense, that Hep A is spread by a virus based on contact with infected feces. Hand washing is strongly encouraged. Conversely, drug use does increase chances for a Hepatitis outbreak. Large hepatitis A outbreaks have been occurring since early 2017 in several other states, including ongoing outbreaks in Kentucky and Indiana, spreading from person to person primarily among people who are homeless and people who use drugs. The Nashville release indicated that based on their confirmed cases , the immediate priority includes men who have sexual contact with men and illicit drug users (injection and non-injection).